My sacred ground isn’t a remarkable place. People hike past it without so much as a second glance. But from the first time I hiked the Mill Hill Loop Trail at William L. Finley National Wildlife Refuge, there’s a spot on the trail that’s always stopped me in my tracks. After hiking through some open forest, there is a sudden, immediate transition from the sunlight of the open trail into the darkness of moss-draped firs. Little light makes its way past the canopy and the thick moss seems to dampen all sound. 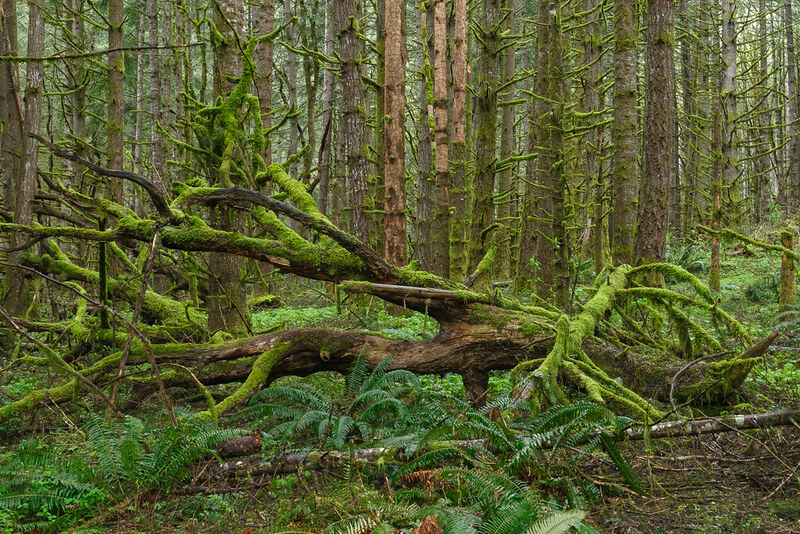 This little section of moss and firs isn’t impressive for the size of the trees (toothpicks compared to the old growth and second growth giants elsewhere in the Northwest) nor for the size of the forest (it lasts just a short while before the trail enters more open forest). It’s a little pocket out of place compared to the surrounding woods at this refuge of reclaimed farmland. A throwback to another time and another place. Stepping into this part of the forest almost always brings a smile to my face, brightens my mood, quickens my pace but then slows my steps, to look up, to breathe in, to listen, to be. I’ve seen a coyote slink off up a forested hill. Laughed at sliding hoofprints of deer where they must have slid coming down a muddy slope. Compared the size of the deer prints next to much larker elk prints. Further up the trail I’ve seen deer, elk, quail, wood ducks, although sasquatch has yet eluded me. But mostly I love this part of the forest not for what I see but for what I feel. There’s only been one time in my life when this enchanted forest couldn’t lift a darkest mood, but that’s a story for another day. The picture above was taken on a rainy day in April. A little earlier on the trail I had been photographing my favorite creature in the Northwest, the rough-skinned newt, but that too is a story for another day.